As we count down the days to the start of the 2018-19 season, A10 Talk will be brining you its preseason power rankings, as voted on by its team of writers. We continue the countdown with #11 Richmond Spiders. There are 3 key names you need to remember heading into the 2018-19 season: Grant Golden, Nick Sherod, and Jacob Gilyard. Those 3 are the 1st, 2nd, and 4th leading returning scorers for the Spiders and should have a monumental impact this season. Unfortunately for Richmond, losses of De’Monte Buckingham to team dismissal and Khwan Fore to the transfer market have stifled what probably would have been lofty expectations heading into the season. Either way, Golden is a sneaky pick for A-10 Player of the Year after he averaged 15.6 PPG and 6.7 RPG as a redshirt freshman. 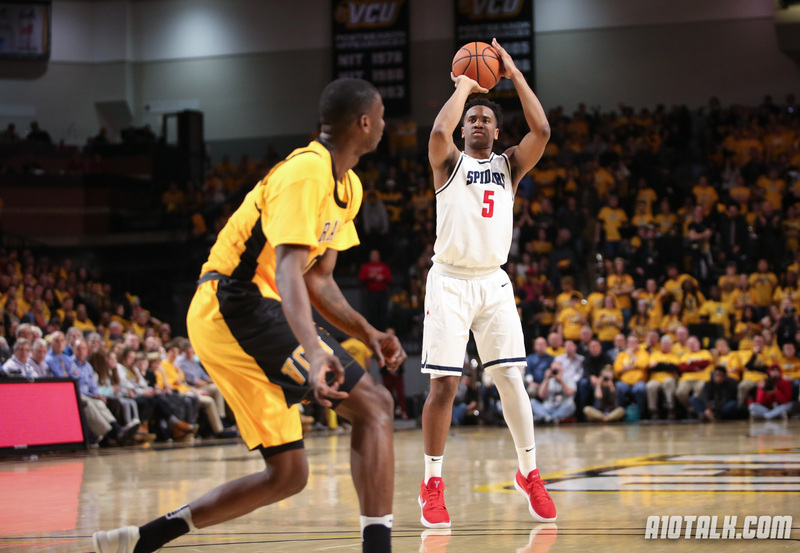 Nick Sherod shot 39.1% from three last season and will be Richmond’s best returning shooter and possibly even best returning scorer. Jacob Gilyard is a defensive pest who averaged 2.8 steals per game and dished out 4.1 dimes per contest on the other end of the floor. After that, the Spiders are stretched a bit thin in terms of returning talent. Julius Johnson will see more court time this season and will have to take a step up. Additionally, Nathan Cayo should step into a more-defined role where he’ll look to contribute scoring and on the boards. Souleymane Koureissi is likely going to be Richmond’s best addition; he’s a 6-8 forward from New York that’s rated as a 3 star pick up according to 247 Sports. He’ll add depth for Richmond on the wing and could help contribute on the boards for a Spiders team that was 12th in the league in offensive and defensive rebounding. Look for freshmen Andre Gustavson, Matt Grace, and Jake Wojcik to get involved as well, as the Spiders have a lot of newcomers and minutes to go around beyond the 3 returning stars mentioned above. Richmond certainly has some interesting non-conference games to mark on your calendars this season. I’m excited to see UR take on Loyola Chicago in Florida this year. The Spiders will also have interesting home dates with Old Dominion and Wake Forest, two games that look very important to Chris Mooney and co. After an abysmal non-conference showing last season, Richmond is going to need to beat the teams it should beat. The Spiders won’t be doing themselves any favors slipping up against Coppin St. or Hampton. Georgetown on the road could be a fun game, but that’s a tall mountain for UR to climb. This will be an interesting year for Richmond, as it arguably has one of the best 3-player cores in the entire conference. Golden, Sherod, and Gilyard are all potentially going to be all-conference players. The question mark remains for the rest of the team. Richmond tired the aforementioned players out last season, as they, Fore, and Buckingham all averaged more than 30 minutes per contest. The bench hasn’t been running real deep in Richmond, and that’s going to have to change. Chris Mooney can’t finish in the top half of the league this year if he’s only got 3 guys making serious contributions. I’m interested to see how the freshmen will develop, as they’ll get thrown into the mix early and often this season. Grant, Buckingham didn’t transfer. He was dismissedey from the team for violations of athletic department policies. grant, the beef was not supposed to be how it read, your facts just are not correct. He transferred only because he was dismissed from the team. He was dismissed from team on April 17. his destination announced a month later. We’re definitely going to miss him, but it was his rule breaking that caused this, nothing else.